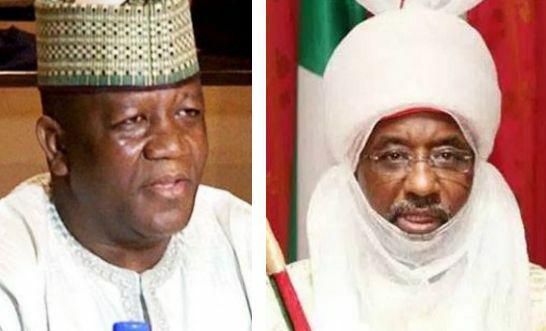 The Governor of Zamfara State, Abdulaziz Yari, has further blasted the Emir of Kano, Muhammadu Sanusi, for criticising his response to the outbreak of meningitis. In a statement released on Saturday through his his special adviser on communication, Ibrahim Dosara. The Governor lambasted Sanusi saying that "the Emir, and all he wants to do is ride a Rolls Royce in the face of palpable poverty; he shouldn’t engage in throwing accusations at others." Yari called the Emir a hypocrite and an enemy of Islam as he advised him to “practise what he preaches” or “keep his peace”. Ibrahim Dosara, his special adviser on communication. “For those who consider the emir of Kano Muhammadu Sanusi II to be anything but a first class intellectual, a consummate banker and a bona fide member of Nigeria’s royalty, the last couple of weeks were a dizzying spectacle of mixed messages on integrity, royalty and wisdom. Within a perimeter of weeks, HRH Muhammadu Sanusi II, whose royal tentacles and social networks traverse the length and breadth of this country, lambasted the nation’s economic framework, the northern elite, sub-national leadership especially the governor of Zamfara State, Abdulaziz Yari Abubakar, and the traditional institution of marriage. All frontiers that we hold so dear. With due respect to our highly revered traditional institutions and royal fathers, as a blue-blooded family member himself, Hon Abdulaziz Yari Abubakar holds the emir in very high esteem. He believes that the emir as a brother and co-occupant of elite positions in Nigeria, he could advise governors and those in positions of authority in several chains of communication that are richly available to him. But he preferred the public platform, for reasons best known to him. Governor Yari firmly believes that a country that goes to its pastors and Imams who recommend prayer and fasting as the solution to every social misfortune, from matrimonial disagreements, to social and economic complications needs to be wary of the wrath of God in the event of an epidemic of unquantifiable proportion such as Type C meningitis. And as a country that succumbs to the supremacy of Allah, we must continue to link Him with all things, fair or foul. Those who want to equate science with God, like HRH Muhammadu Sanusi II, can denounce Yari’s statement from the rooftops but that will not change Governor Yari’s beliefs in the omniscience, omnipresence and omnipotence of Allah. By a certain bizarre coincidence too, like a prophesy foretold, Sheikh Mahmood Jaafar had before he was assassinated named Sanusi Lamido Sanusi as one of those whose hypocrisy would bring an epidemic of monumental proportions to this country. The tapes are very much in circulation long after Sheikh Jaafar’s death. He had argued in that sermon that “Sanusi Lamido is one of the enemies of Islam who would assume all traits of a good Muslim but deep inside them is a hatred of Islam, and the people far beyond human imagination.” Could this be a prophecy foretold? However, the emir should be aware that Allah who gives power to whoever He wills at His own time, also takes it away at the most inauspicious time. As elected officials, we are obliged to serve people just as we serve God. Within this precinct Governor Yari has done his best. As representatives of the best of our traditions, our Emirs, chiefs, kings and queens are also obliged to lead by example, show empathy, adjudicate with compassion, display wisdom and embrace the fear of God, in all they do. In this HRH Muhammadu Sanusi II is struggling. Recently, our erudite emir has been mired in several controversies, which rather than enhance his profile and the integrity of royalty, have put him very much on the spot. And the emir has put up a spirited defense of all the allegations against him. But he was not transparent enough, as he always accused officials, especially governors, to tell the public what he found in the Kano Emirate palace coffers when he ascended the exalted throne. This is the least of his people’s expectations of him. It was the first that our finest royalty would offer. Sacrifice is another attribute known to our royal fathers. But when an emir pledges to commit his hard earned resources for the face-lifting of the palace where he alone would reside and eventually transfers the burden to his impoverished subjects, there is a breach, or a problem. Late Sultan Ibrahim Dasuki, of blessed memory, used his money to rebuild the Sultan’s Palace in Sokoto to his taste, but until his demise, he never tendered the bill to his subjects for reimbursement. Over time, we know our traditional fathers for their compassion. When their friends from far and near offer to assist them, they would rather the assistance was given to alleviate the sufferings of their people in cash or kind. But for a traditional ruler who identifies the problems of his people and utters these words: “We are in denial. The north-west and the north-east, demographically, constitute the bulk of Nigeria’s population, but look at human development indices, look at the number of children out of school, look at adult literacy, look at maternal mortality, look at infant mortality, look at girl-child completion rate, look at income per capita… The north-east and the north-west Nigeria are among the poorest parts of the world,” and yet when his friends offered help, he asks for a Rolls Royce. There is more than a fundamental problem. There is a big disconnect. Like Governor Yari has always said, his respect for our creator will never waver. He will also rue joining issues with royalty, in Nigeria or anywhere in the world. He maintains that his reverence of the institution that HRH Muhammadu Sanusi II represents is also unshaken. Hon Abdulaziz Yari Abubakar is only asking HRH to either practice what he preaches or forever keep his peace, because in a situation where epidemics are taking our children, maternal mortality, uneducated youth, social vices and incompetent leaders are the national scourge, to borrow the words of the emir, and all he wants to do is ride a Rolls Royce in the face of palpable poverty, he shouldn’t engage in throwing accusations at others. Kano kingdom is an important kingdom amongst the kingdoms in Africa. It is also an important and strategic institution in the history of Nigeria. The occupants of the seat before HRH Muhammadu Sanusi II played a significant and dignified role in making Nigeria what it is today. They respected themselves. HRH should emulate his predecessors and not play to the gallery in a manner that ridicules his own heritage”.